Description: 1311 waits for a signal at Munster, IN. Description: CN 7076 waits for attention at the diesel service building. There's no indication who her next owner may be. Description: Couldn't quite make out what this unusual loco heading around the CSX curve was but did know it was unusual compared to the CSX units that roll through Dolton. Description: The orange marker lights on topof the cab and the white piece just behind looked unusual from a head on view. Description: Side view made the identification easy - three separate vents and fans confirmed it as a genset loco. The label that read "Ultra low emission diesel genset locomotivie" on the side behind the cab made it obvious! Description: CSX 940 leads a 7-unit mix of power to make up an afternoon train of mixed freight at Fairburn yard on July 20, 2018. 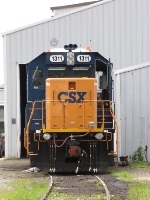 Description: CSX 5459 runs second in a 7-unit mix of power making up an afternoon train at Fairburn yard on July 20, 2018. 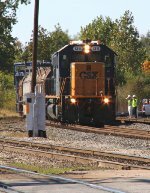 Description: CSX 288 runs third in a 7-unit mix of power making up an afternoon train at Fairburn yard on July 20, 2018.